We're half-way through the debut of Ducati’s first proper off-road adventure bike, the Multistrada 1200 Enduro, and even with just 50 miles of Sardinia’s finest fire-trail under its Pirelli Rally tyres, it’s not too soon to say the Ducati’s long-established rivals in the adventure bike class had better start making room for one more. And the way the 1200 Enduro promises to shake up the scene, they’d better give it plenty of elbow space. Because the 1200 Enduro is simply, an outstanding bike. The standard, road-based Multistrada is an excellent machine, but the new off-road features of the 1200 Enduro suddenly snap the concept into sharp focus. You literally jump on the bike and within a few yards start slapping your forehead and wondering aloud why Ducati didn’t do this years ago. It makes so much sense. Yes, the new wheel sizes and off road control and styling tweaks have opened up fresh ways to explore the landscape – over a fairly simple, but slippery and definitely off-road track the Enduro proved confident and easy to manage even for a cautious off-road novice. 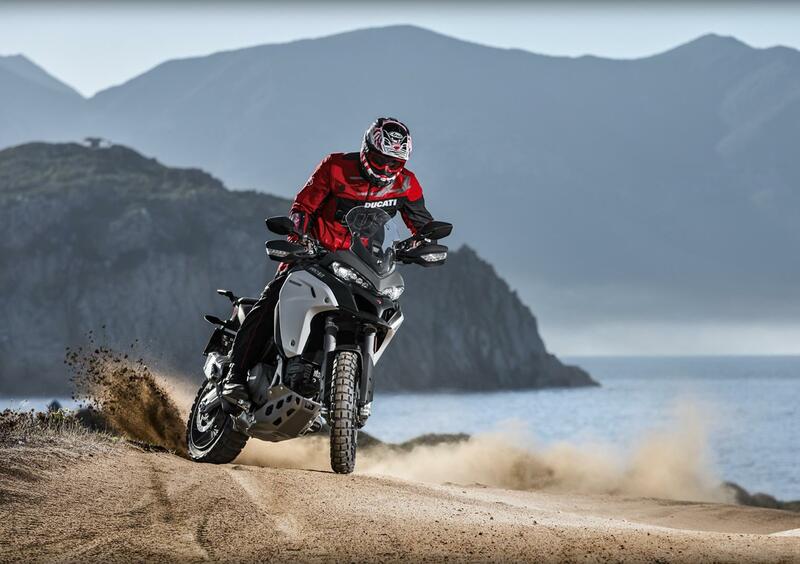 Trail-riding experts will be flinging the thing sideways everywhere, but they probably could the old Multistrada too so it doesn’t prove much. The point is the new Enduro lets ordinary riders experience some of that fun too. And that’s an impressive quality. This afternoon we have more miles of road riding on the Enduro to see if the off-road tweaks have compromised its mile-crunching ability. Although seeing as the Enduro shares its 160bhp V-twin, with variable valve timing, with the standard bike (in fact it’s even peppier than the 1200 S – it’s geared down by three teeth on the rear sprocket), and has the same frame, same semi-active suspension (different damping rates), and same massive list of spec and features – plus a 30 litre tank and 280-mile range – it’s going to take a quite a few laps of Sardinia to find out. Read the full launch verdict in next week’s MCN.